Marcos and I began chatting on the bus to Tequila. He plumped himself down on the seat next to me and introduced himself. We went through the ritual of making small talk. He must have been in his early 30´s. He was good-looking in a dark Spanish way – head of black wavy black hair, olive skin, moustache, regular jaw line. From the way he was dressed – neat shirt and trousers – I would have picked him as a public servant or a teacher. In fact, he was a security guard at a Tequila factory. 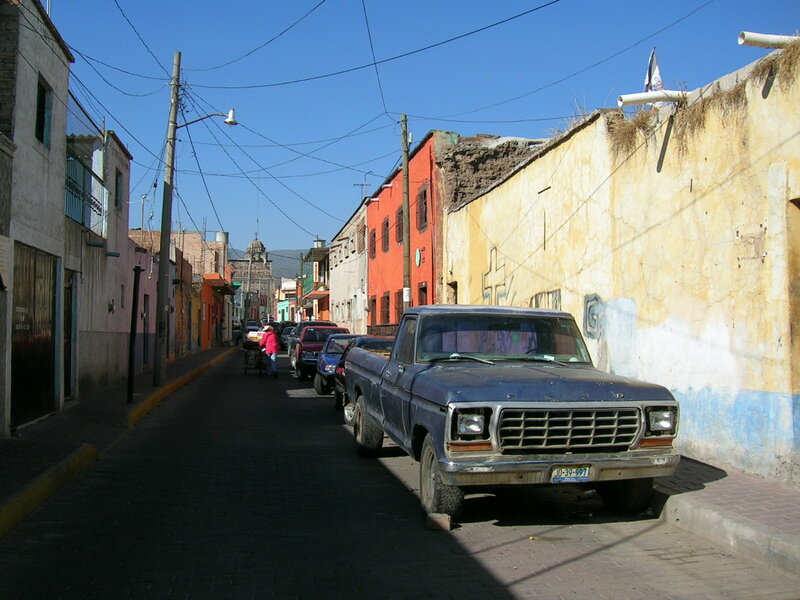 I was on my way to Tequila because it seemed only natural to visit the town where Mexico’s famous national drink was made. I had no desire to actually drink the stuff. I was a dedicated wine drinker. The few times I had tried Tequila during my short trip to Mexico (just over 2 weeks) was enough to convince me that it was an acquired taste – one which I was unlikely to ever acquire. Tequila was distilled from a cactus-like plant called ‘blue agave’. The blue agave plant was a series of tall, stiff, light blue fronds radiating out of the ground. At the heart of the plant was a thick bulb. The blue agave plant was left to grow for eight years before it was harvested. The fronds were slashed off with a machete and the bulbs, resembling giant pineapples, were collected and taken to the factory where they were cooked, pulped, fermented and then distilled. There were four kinds of Tequila and each one was quite different to the other, something which came as a surprise to someone like me who assumed that Tequila was Tequila was Tequila (which was about as ignorant as assuming that all wines were the same). There was white Tequila or ‘blanco’, which was clear and had a strong taste of the blue agave plant (a taste which made me want to vomit). There was gold or ‘d´oro’, which was white Tequila with sugar and caramel added to tone down the blue agave flavour (but not enough for my liking). There was ‘rested’ Tequila or ‘respado’ – white Tequila aged for at anywhere between 2 to 10 months in oak barrels. Then there was old Tequila or ‘anejo’ – white Tequila aged in oak for anywhere between 1 and 3 years. This was the only kind of Tequila which I could possibly drink – and then, with plenty of orange juice and lots of ice. Tequila was first distilled in the 17th century in the town which gave it its name and since then, the situation had remained pretty much the same: Tequila the town was the home of Tequila the drink. There were two big distilleries in Tequila and in addition, many small ones. The two big ones had been bought up I was told by big American concerns. Only the smaller ones were still owned by Mexicans. It was at one of these that Marcos worked. These smaller distilleries I understood, were niche distilleries. Each of them produced a different kind of Tequila within the four broad categories. There were Tequila connoisseurs who had their own favourite distillery – and who regarded all other tequila as inferior. Pretty much like the wine industry, in other words. The countryside outside the window of the bus could have been somewhere in Australia. It was dry, brown, barren. There was a line of treeless hills on the horizon. The major difference was that here, the dry hills were covered in fields of the blue agave cactus plants, hundreds, thousands, of spiky fronds radiating out of the ground. His story was a typical one for millions of Mexicans: it involved the United States. 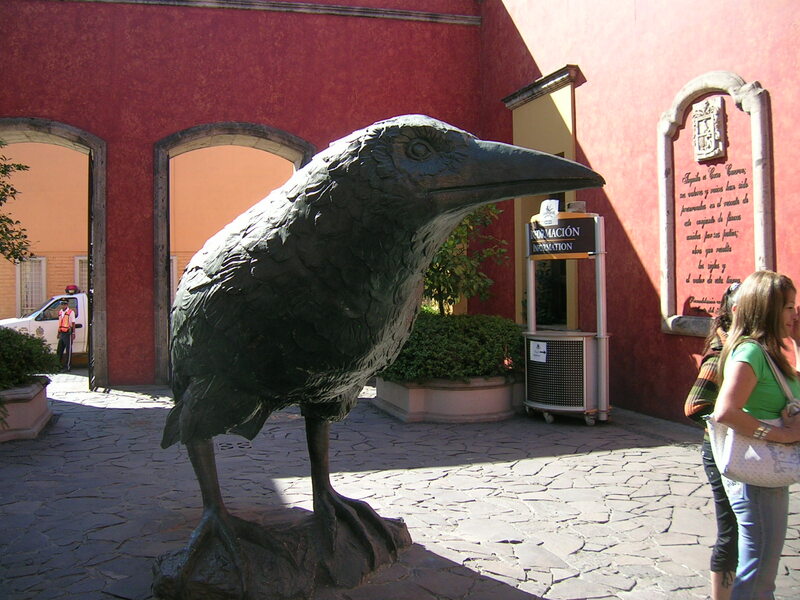 He lived at the outskirts of Guadalajara, a big city not far from Tequila. He had a brother and sister living in Los Angeles. They were permanently settled in the U.S. and came back to Mexico now and then for a visit. He had spent five years in LA where he had rolled into the security guard business and got himself a diploma. Then he´d come back home and got married and had two daughters. He drank two shots of tequila every day he said, never more: Tequila blanco. Besides speaking good English – something rare in Mexico – Marcos was well-informed: ”get to read a lot of newspapers and books at nights’ he told me. We talked about world politics for a while; about the U.S and Mexico. Our conversation was temporally interrupted when two small grubby boys wearing baseball caps got on the bus and started singing. Their voices were so shrill that they were ear-splitting, even for my deaf old ears. 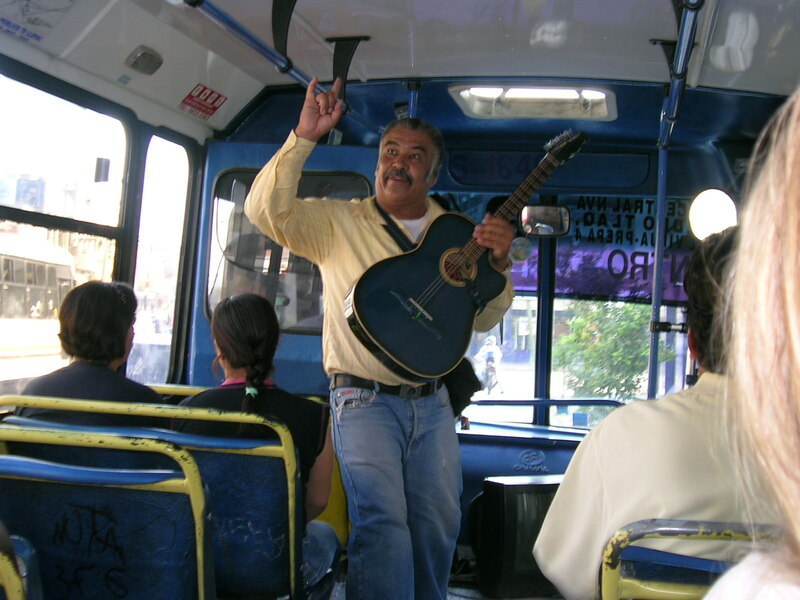 Whenever you took a local bus in Mexico, every stop brought a wave of vendors, hawkers, salesmen, con men and musicians. Sometimes you struck it lucky. Earlier in the day, on a bus from one side of the big city of Guadalajara to the other, a middle-aged man had climbed on with a black acoustic guitar. With the bus lurching around corners and stopping and starting, he had stood in the gangway and played his guitar and sang – and he was good. He had a rich baritone voice – which sounded all that more beautiful because he was singing in Spanish and his guitar playing was outstanding. It was a stunning performance and I wondered how it happened that a man of his talent ended up playing in buses running the slums of Guadalajara. The little boys on the bus to Tequila however were not talented. They sang perfectly in unison, two unbearably shrill voices reinforcing each other. After a finale of the Mexican national anthem, they went around with their caps in their hands. I was glad to see the last of them. I asked Marcos if his job ever got dangerous. I had in mind a kind of Mexican mafia, something akin to the drugs mafia, one interested in say stealing a few thousand gallons of Tequila. That would be worth a lot. Sure he said, there were dangers in his job alright. Not from the thieves and mafia – but from the other security guards. In Mexico he said, you didn´t need any kind of training or diploma to be a security guard. Marcos lived in fear of his work colleagues – as well as being untrained he said, they were also grossly overweight. Instead of chasing after a suspect they were more likely to blaze away with their rifles and ask questions later. He didn’t seem to think that this constituted a safe work environment. But he didn’t want to go back to America either. At a stop before Tequila he got out. I said goodbye and watched him. He crossed the road. On the other side was a high white washed wall and behind it, a graveyard: a jumble of vaults and crosses and angels and cherubs, some of them askew due to the ground sinking. Behind the graveyard was a row of trees and set back behind these, the Tequila factory, white walls and red tiles. Marcos walked past the graveyard and disappeared from view. Did it ever cross Marcos’s mind that one day he might end up in that graveyard? 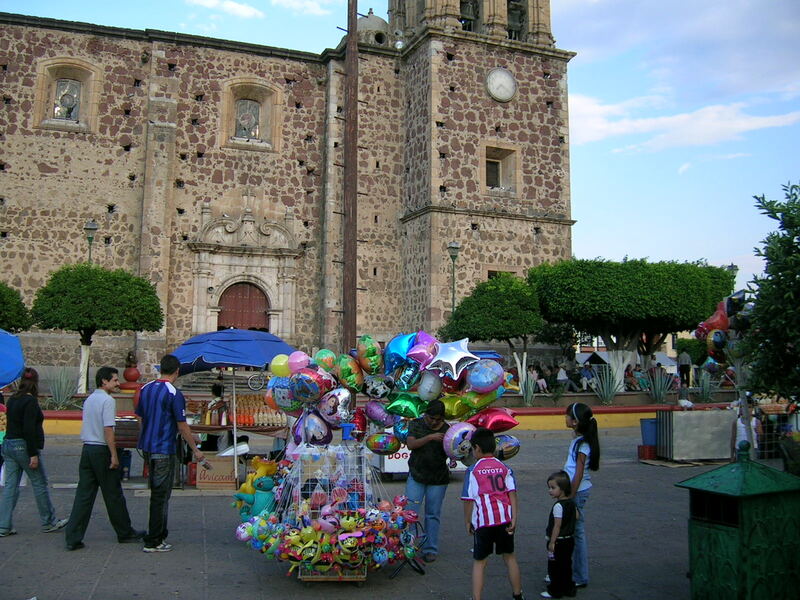 When I arrived in Tequila, I was exhausted. 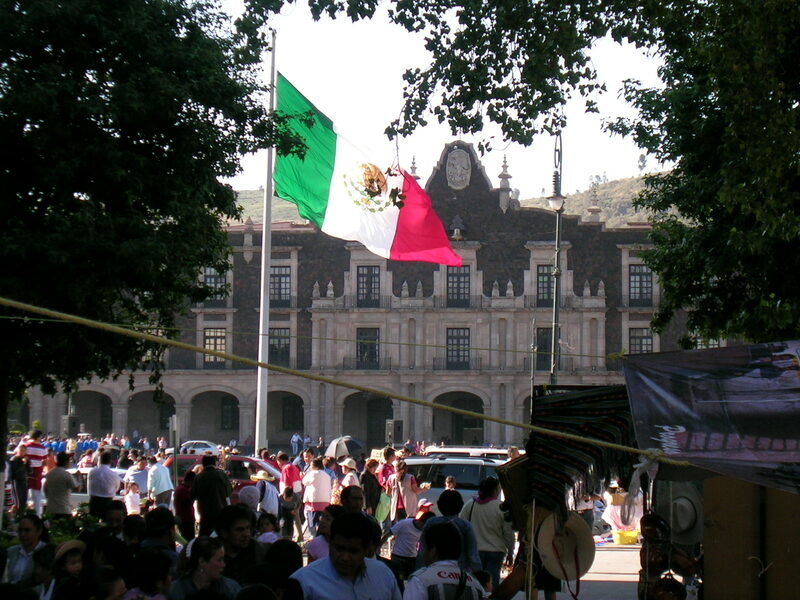 I’d been on buses all day – 6 hours to the sprawling city of Guadalajara, an hour from one side of Guadalajara to the other, and then the trip to Tequila – two and half hours. In a haze I walked down the main street to get my bearings and find somewhere to have something to eat. 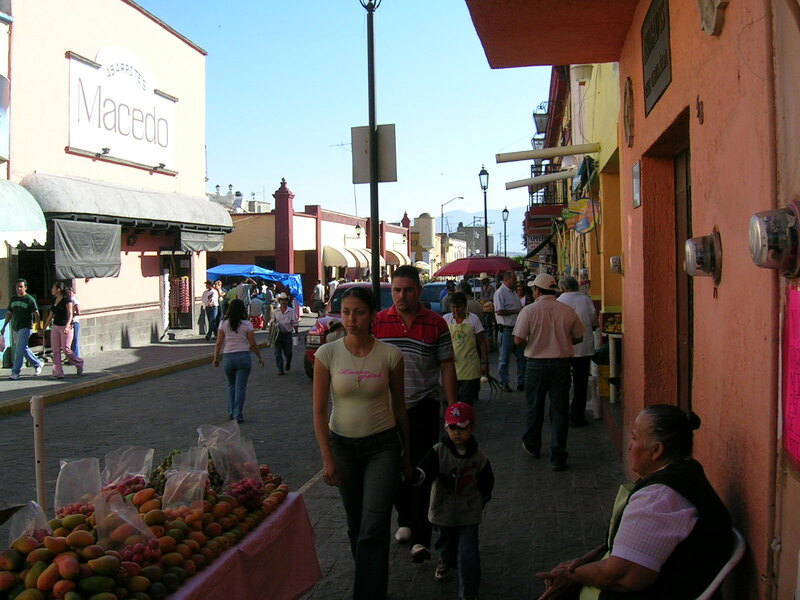 Getting off the bus and walking down the main street I had the feeling I could have been in any old small Mexican town. Tequila was nowhere near as touristy as I’d expected. There was a run of tasteless tourist shops selling cheap souvenirs and bottles of Tequila, but there wasn’t a western tourist to be seen anywhere. 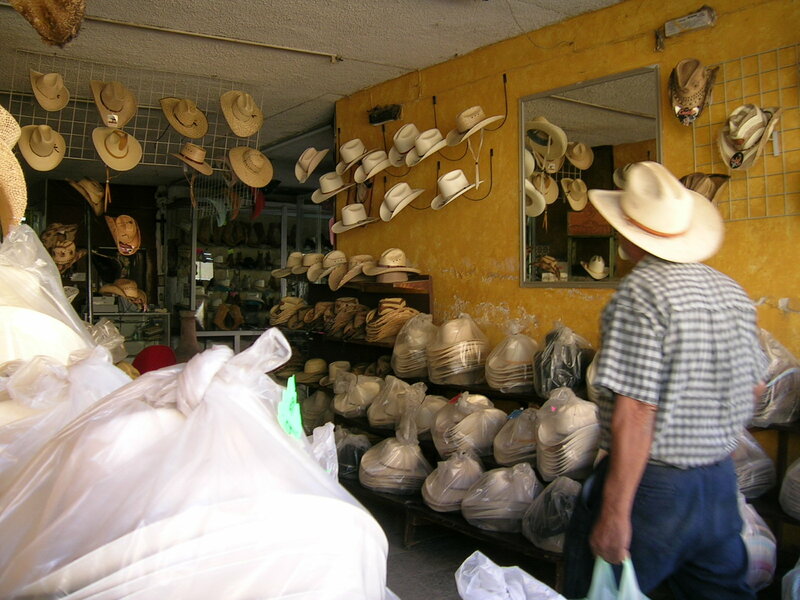 Mexicans wearing white cowboy hats drove Dodge and Ford pick- ups down the main street. In the narrow cobblestone side streets there were markets and small shops and houses. At the end of the main street there was a cobble stone square and an old cathedral. In front of the cathedral were two statues of angels with outstretched wings. The walls of the cathedral were made from big pieces of stone set into a red clay and mortar mix. Near the high arched doorway was a statue of a saint beneath which a short text which mentioned that the cathedral was over 200 years old. Left of the cathedral was a long plaza with trees in big white-painted cement boxes, bench seats and a bandstand. Beyond the plaza was the Jose Cuervo Tequila factory which I was planning on doing a tour of – and not much further away, another destination on my tourist agenda, the Tequila museum. I arrived in Tequila on a Saturday afternoon. After midnight the Tequila cathedral began ringing its bells every hour. I heard them from my room but I was so tired I slept through them. 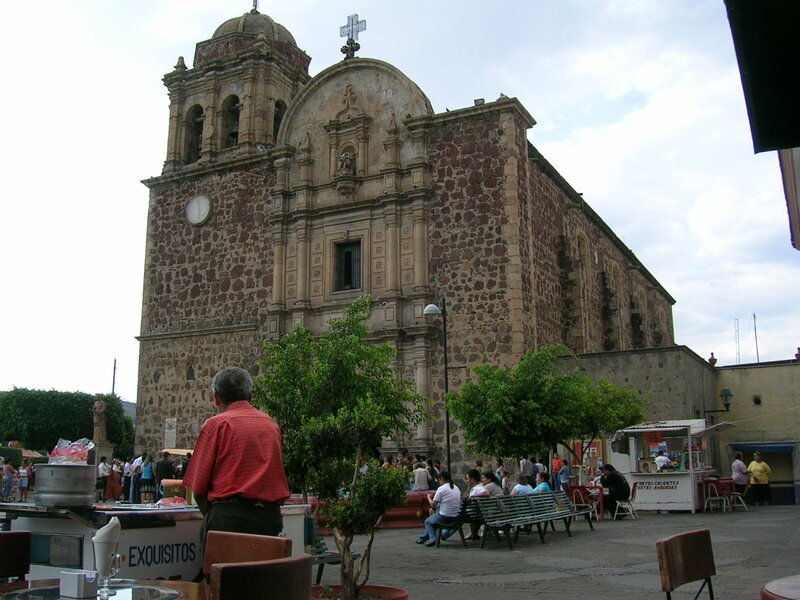 On the Sunday morning I got up, had breakfast and head to the cathedral with the intention of attending a mass before going on to the Jose Cuervo Tequila factory and the Tequila museum. But when I got to the cathedral I found that it was packed out. There were crowds standing at the two open doorways listening to the service being relayed over loudspeakers. In Mexico religion had seriousness which I’d never seen during my travels in Spain: the Mexicans were far more devout Catholics than their brothers and sisters in the mother country. Sometimes their devotion bordered on superstition. You didn’t need to look too far to find examples of shamanism and relic worship and belief in ghosts and spirits. In the afternoon I made another attempt to attend a mass but once again it was a full house. Instead I head back to my room and slept off the effects of my Tequila tastings. In the evening I walked around town and ended up at the plaza next to the cathedral. There were a surprising number of people there. All of the bench seats were full and lots of children were running around playing games. A group of old men mounted the bandstand carrying trumpets, saxophones, drums and piano accordion and started playing. They stood around the edges of the bandstand facing inwards; in the space in the centre of the bandstand, a group of children began dancing. As darkness fell, more people turned up. Sunday evening was apparently a bit of an event in Tequila. Groups of teenage girls, dressed up and wearing make-up and high heels, walked around in groups giggling and eying the boys. These were also prowling around in groups, many of them wearing white cowboy hats and boots and trying to look macho although their faces displayed nervousness and insecurity. Mums and dads and grandparents ate ice creams and kept an eye on the kids. After an hour or two, the band of old men got tired and left the bandstand. Another band, consisting of young men got going at the far end of the plaza. At 9.30 I started making my way back to my hotel. Making my way through the crowd towards the cathedral and the square in front, I ran into a wall of people milling around. There was another band playing there, near one of the angels. All sorts of vendors had set up little kiosks on wheels, selling tortillas, hamburgers and hot dogs. The little restaurants and cafes at the sides of the square were packed. The main street was clogged with people on their way to the festivities. As I passed the doorway of the cathedral I saw light shining over the heads of the crowd. There was another mass in progress. Tequila’s priest certainly earned his keep. Because the music from the bands was so loud the sound of the mass coming from the loudspeakers was drowned out. I wormed my way through the people and stood on my toes to get a glimpse of the proceedings inside. The cathedral was a typical Catholic house of God – it was a gallery of saints and angels and candles and flowers and statues and paintings. There was a massive intricate gilded altar. Everywhere was the image of Christ – baby with Madonna, performing miracles, last supper, judged by the Romans, condemned by the mob, crucified. There were two lines of pews cram packed. At the front next to the altar a priest sat in a big gilded chair, like a throne. He was dressed completely in white. There was a microphone at the end of a long chrome stem right in front of him. He was singing and the congregation was singing with him. There was something splendidly schizophrenic about what I was witnessing. On one side of the cathedral’s 200-year-old walls was a scene of mass devotion – and on the other, it was carnival time. Inside the cathedral, the tortured body and beautiful soul of Jesus was worshipped with a reverence the likes of which I’d not seen anywhere else in the Christian world. Outside the house of God a fiesta was in full swing with music and food and love and noise and talking. At the start of my short trip to Mexico (a stop-over on my way to Amsterdam), a question had occurred to me which during the following days, grew into something more: a view-point supported by accumulating evidence. I had asked myself why Mexico, colonised and settled by Europeans around a 150 years before the U.S., was nevertheless so much poorer and so more corrupt. The difference between the two neighbouring countries was profound; one was a superpower, the other a basket-case. Theories based upon a ‘North exploits the South’ theme made little sense in the longer, historical perspective. Religion it seemed to me was a far better explanation. Mexico was settled by southern European Catholics and the U.S. by northern European Protestants. Catholicism had been based upon collective values and an authoritarian hierarchy, at the heart of which was a caste of priests allied with a traditional aristocracy of big landowners. Protestantism on the other hand, was based upon individual initiative and self-reliance, on opportunity and elected politicians. Free of vested hierarchies and traditional obligations, the Protestants in the north had proved to be far more energetic than their neighbours in the south. Their society embraced change and progress; the Catholic society in the south had resisted it. One country innovated and advanced the other remained imprisoned by itself and stagnated. At first I thought he was talking about the physical differences. No doubt about it, most Mexicans were physically small in comparison with Americans and Europeans. But he wasn’t talking about physical size. He was talking about mentality. ‘The Americans want to build a rocket ship which can take them to heaven, even further, but the Mexicans, they’re happy to leave heaven to the priests. All they want to do is live their lives and try to be happy’. After five years of living in America, Marcos had decided that he wanted to be a small man and not a big man. He wanted to be surrounded by his family instead of only seeing them a few times a year. He missed his country. On this night it was easy for me to see why a man like Marcos might decide to throw in his lot with the small people, the people who didn’t have any great ambitions besides trying to have a happy life. All around me there was a colour, a life, a verve, which swept me away from my island of dry reasoning, of intellectual assessments: my own self-inflicted straight-jacket. I could see a unique culture before me, something far beyond the Tequila industry: a society which might bind, might imbue its inheritors with a powerful sense of belonging. What I was not so sure about was living in a country where one ran the risk of being shot because no one thought it worth their while to train their security guards.